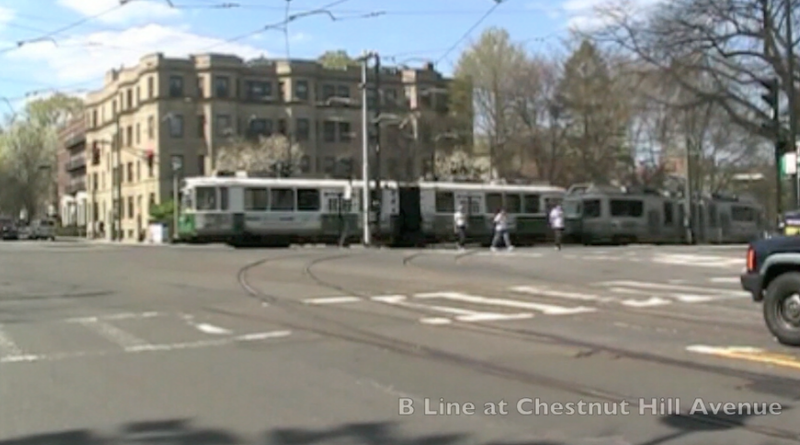 As is explained in Streetcar Tracks, the first part of the B branch to be serviced by electric streetcars was the section between Chestnut Hill Avenue and Lake Street near Boston College. Originally, the streetcar would run until Cleveland Circle on the tracks that the C branch now uses and then diverge up Chestnut Hill Avenue before turning left onto Commonwealth Avenue, where today's B branch runs, and continuing to Lake Street. Later on in 1900, a second streetcar line, the modern B branch, was added when the Commonwealth Avenue tracks were extended to Kenmore Square, where the B branch enters the subway today. For old photos of the B branch and the original streetcar line that used part of the tracks, I encourage you to watch Streetcar Tracks! An interesting feature of the B branch was the Braves Field Loop. When the Atlanta Braves were the Boston Braves, they played at Braves Field, a stadium just off of Commonwealth Avenue that was located roughly where Boston University's Nickerson Field stands today. Braves Field was extremely well-serviced by streetcars. In addition to the B branch, and at the time the A branch, running along Commonwealth Avenue, a second streetcar loop that looped streetcars off of Commonwealth Avenue and right next to the stadium existed exclusively for the Braves' home games! Loop trackage existed on Harry Agganis Way (then Gaffney Street, Babcock Street and in between on an exclusive right-of-way as recently as 1946. The right-of-way-has since been demolished during redevelopment of the area, though traces of the trackage remain as shown in Streetcar Tracks! 1946 Boston map showing the streetcar right-of-way between Gaffney and Babcock Streets. A 1961 MTA trackage map showing the Braves Field Loop, by then called the B.U. Field Loop as the Braves had left for Milwaukee in 1953. 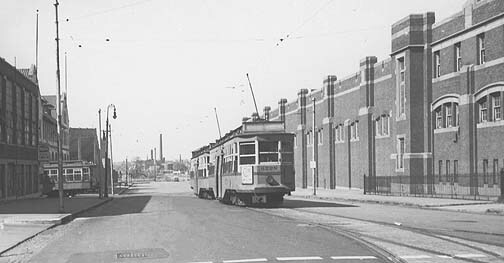 Center-entrance streetcars pictured by Braves Field on the Loop. These high-capacity streetcars, nicknamed "crowd swallowers," were perfect for carrying ballgame crowds! Special rounds of streetcars would run at game times, and during games streetcars would lay over on the Loop to pick up game attendees at the game's conclusion. Such operations are characteristic of pre-automobile America, when streetcars were the primary mode of transportation. Note that in the photograph above, taken when the Loop was in use on a game day, no cars line the street. Nowadays, parking on streets such as the one pictured, which was directly by the stadium, would be fully occupied on such an occasion!